The old roofing is gone; tar paper covers the roof; and new 2x6 framing is being installed. Insulation will fit between the 2x6's and then a new metal roof will be installed. This cold-in-past-winters house should be cozy this winter with all the new roof insulation. Along the outer edges of the old roof rot was uncovered (always surprises in remodels) so there is also removing and replacing happening. From the top one can peer into the kitchen and living areas. From the bottom one can fully visualize the drama of the 18'x5' skylight running down the ridge. It's also dramatic to see the large I-Beam running the entire length, under the skylight. Lois, looking quite pleased, with the light she has longed for pouring into her living space. What Brad says about Lois, "She a great client and can always be made to smile!" What Lois says about Brad, "He's so creative it's fun to work with him. He makes me more creative as we toss ideas about." The neighbors have been dropping by and commenting on the clean site, despite the large scope of the construction project. Yesterday the site had a hit of piles. Mess, or not? A huge dumpster arrived to hold the old roofing material; a giant pile of insulation was delivered; and another pile of 2x6's arrived. But, the neighbors are still right, although it might not, at first glance, look like a clean site. The piles are all building materials waiting to be used or waste tightly contained. On close examination it is clear that the site is still clean -- no empty cans or candy wrappers blowing here and there and no stray pieces of old roofing or boards with nails carelessly thrown about. Keeping a clean site makes working conditions more pleasant; the owner's remodeling life more manageable; and the neighborhood more content. It's a goal to strive for even throughout the most complex construction project. Always a big task before work can begin in earnest on a new project is setting up the work space. Fortunately, Lois has a two car garage, half of which can house tools and a myriad of building materials. These shelves were constructed quickly to hold items Lois needed to remove from her home to make room for the remodel. A valuable part of the design build process is exploring design ideas. Both on paper and on site it is always informative to talk, draw, mock up, change, and reexamine the details. Mocking up a design element before proceeding can be both fun and useful. How much more satisfying to make adjustments early on with all parties participating. This is the mock up of the entry porch, with ramp, or bridge and stairs, to see how it looks and feels to use. Note: deck is gone and patio furniture (far right) is where the future patio will be located! 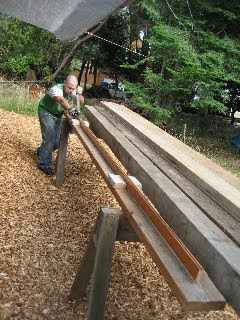 The mock up process is especially useful when using recycled material. A particular siding might be called out but because of some recycling opportunity, another material might become available. Hanging the new material on the building to "try it out" is exceedingly informative and enhances everyone's ability to envision the change. On the Fredley project (fredleyonwhidbey.blogspot.com) we had always planned on using HardiePanel for the siding on the main building. Then one day Brad noticed the barn at the Fair Grounds was getting a new roof. What were they doing with the old roofing? An inquiry was all it took and the old roofing was ours. We couldn't have planned on getting this material but once we did we needed to mock it up to see if we liked the change over our original design. The rest is history -- we loved it. Being sustainably minded permeates every thought one has about a project. 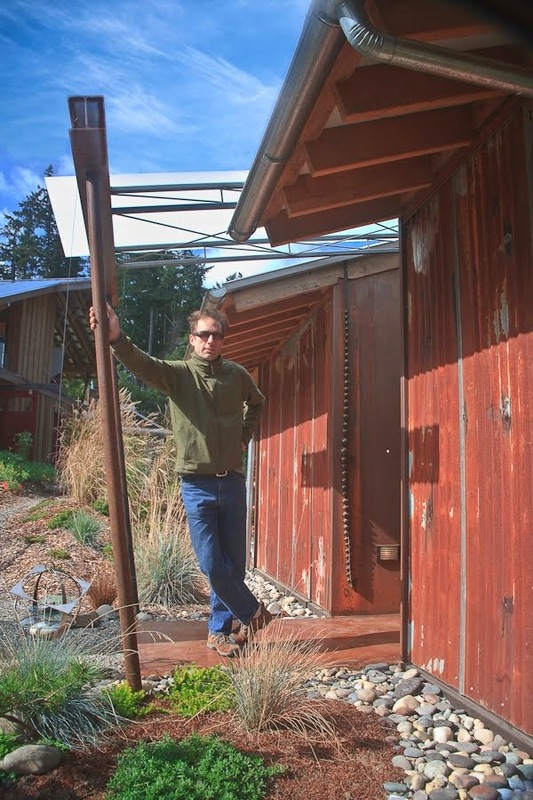 In this remodel, keeping the house, and making it better is definitely sustainable, and recycling at its best. But, when does one deconstruct to make it better and when does one make do with what's existing? Rethinking decisions is an ongoing process -- always! When Fran Abel did a landscape design for Lois a year ago, this deck was incorporated in the landscape design because it was there, although we agreed it didn't work well. We questioned the wisdom of keeping it at that time. Now, with a new entry on this side of the building, and another year of observing the lack of function and unattractiveness of the deck, it was reevaluated. In a "let's put our head's together" consultation with Lois, Brad and Fran yesterday we decided the wood can be better used elsewhere. The deck is being deconstructed today to make way for an entry porch and a patio. In making this change, this beautiful sunny side of Lois' home will function better and, without this hard surface dominating the building, more plantings can be added to soften the home . This is the sweet little home that's getting a remake -- mostly indoors, but some outdoor changes as well, like an entry porch, new roof, privacy screening and 18x5' skylight along the ridge beam. Some creative scaffolding helped get the job done. The I-bean was lifted into place, inch-by-inch , first one end and then the other, until it was in place at the ridge and secured. Here's the roof supporting 24' I-beam getting prepared -- grinding and spraying -- before it is lifted into place. The roof gets braced; carpeting and other flooring are removed; and the gas stove in the living room goes away. 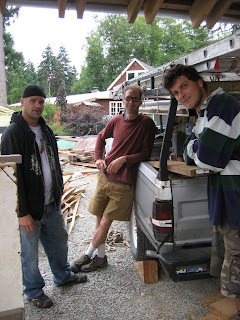 All of this work happened last week as Josh, Travis and Brad ripped into the demolition part of the remodel with gusto. The wall between the kitchen and living room will be entirely removed, but is partially left, so Lois can still have a functioning kitchen throughout a large part of the remodel project. Cutting the wall back from the ceiling a few feet, as you can see in these photos, is to allow for the installation of a large steel beam (24' long) running from north to south to support the roof and allow for the kitchen and living areas to be one space. This is the kitchen, already a bit changed as Brad and crew prepare to head into demolition, but largely a good shot of "before". The appliances on the left have been covered to protect them and items like the TV and large black chair are simply residing in the kitchen to get them out of the way as work proceeds. This room will change significantly as the remodel proceeds. Lois was out of town as the tearing into her orderly and clean home began. I'm sure her return will result in both excitement at the changes and horror at the changes. That's the way of a remodel. A little over a year ago, Fran blogged about Lois visiting the Fredley site and discussing the possibility of Brad doing design work on her home in Greenbank. Well, this week the construction has begun! The step from the design process--drawings and discussions and researching and pricing and planning--to actual construction is always exciting. Lois has better entryways and covered outdoor areas, a new roof with skylights and a big steel I-beam (we love steel), and new (re-used) flooring to be excited about. I suspect it's more demo (or deconstruction) than construction at this stage, but we'll get into that later. Details about the first week are coming soon. One of our goals for this blog is to use the projects of design build B.R.A.D. (dbbrad)as a springboard for discussions about what it means to be sustainably minded. Sustainability is a complex concept--a scientific idea often discussed in terms of moral decisions. We'd like to untangle and explore this concept, and present some concrete examples of what sustainability looks like in the design, construction, use, and disposal of buildings. We'd also like to hear your thoughts and questions about what sustainable (or green, if you prefer) building is. We would love for you to comment on our posts and contribute to the discussion. A topic we frequently discuss is re-using materials. Brad recently purchased some old fir(?) flooring from the Re-Store in Bellingham to use in the project the crew started this week. used flooring before it can be installed in its new home. We look forward to a closer look at the process of re-using flooring through our weekly updates of the Lois Remodel--first post coming soon! Inspired by the recent launching of www.dbbrad.com (still very much under construction), we at design build Brad decided to start a blog following the progress of Brad Hankins' current projects. Perfect timing since Brad and crew begin a remodel project this week. They've got the Wonder Truck all loaded up to head out to the new site. So... come back often. We're aiming for weekly project updates.